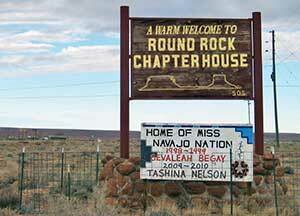 TOP: A sign welcomes visitors to Round Rock Chapter and boasts of its two Miss Navajos, Sevaleah Begay (1998-9) and Tashina Nelson (2009-10). BOTTOM: Students from Concordia Charter School file across the the chapter compound to lunch at the senior citizens center, where the school shares the kitchen and dining area with the seniors. The imposing sandstone mesa known as Round Rock, or Tsé Nikani in Navajo, invokes a fortress. And that’s exactly what it was. Blessed by good grasslands watered by two washes, the people of this area were constantly having to defend themselves from encroachment. In the 1600s it was from the Spanish, and later the Mexicans, who became the New Mexicans. Occasionally, it was the Utes. When the Diné needed to retreat from a skirmish on the grasslands, Round Rock was always there. When the advancing army caught up with them, they simply hauled the ropes up, leaving their foes gawking up at them. There were springs on the mesa top, and edible plants, even some game. The Diné could survive as long as they needed to. Self-sufficiency is a skill the Round Rockers would have to fall back on again and again, up to the present day. Name: This area has two names depending on whether you are from the east or west side of the chapter. The western side is named after the big round mesa you can see from miles around, Tsé Nikani in Navajo or Round Rock in English. The east side, toward the grayish cliffs at the foot of the Chuskas, is known as Bis Dootl'izh Deez'ahi (Blue Point Mesa). Since the community recently lost its post office with the closure of the trading post, suggested Community Services Coordinator Shirley Sorrell, it might be a good time to change its name to the Navajo, Tsé Nikani. "That way," she said, "We wouldn't always be getting mixed up with Rock Point and Rough Rock." Famous daughters: This chapter produced two Miss Navajos, Sevaleah Begay (1998-9) and Tashina Nelson (2009-10). Education pioneer Ruth Roessel hailed from here, although she spent much of her life at the demonstration school in Rough Rock that she and her husband, Robert Roessel, helped to found. History: Round Rock was the site of one of the most tense confrontations between the Navajo and the U.S. government. In 1892, Indian Agent Henry Shipley visited Round Rock to tell the people schools were being established for the Navajo children in the area and parents would be required to send their children to them. Shipley was less than diplomatic and drew the ire of a leader named Black Horse, who worried the white man's education would spell the doom of Navajo civilization. Black Horse and his followers beat Shipley almost senseless and were about to throw him over a cliff when, according to oral history, a man named Bead Clan Gambler intervened. Instead, the Diné barricaded Shipley in the trading post for days until some troops were sent up from Fort Wingate to restore the peace. Plans to start a school in Round Rock were postponed, but eventually the community did get a BIA school that was later replaced with a public school. Last year, it also got a charter school. To read the full story, pick up a Navajo Times or subscribe online by going to www.navajotimes.com.